Feeding your cat. Sounds pretty basic, right? Well, there are some things cat parents can do that may influence how successful the mealtime routine is for their cats. 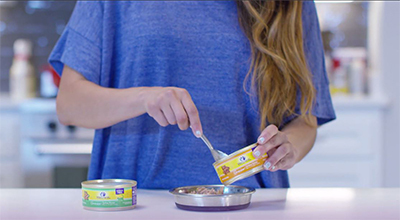 What you feed your cat, when you feed, how food is offered and even where the feeding station is located are all contributing factors to whether kitty gives it a paws up or a paws down. Here’s my list of 10 tips to help you create a mealtime environment that follows your cat’s natural instincts and desires. 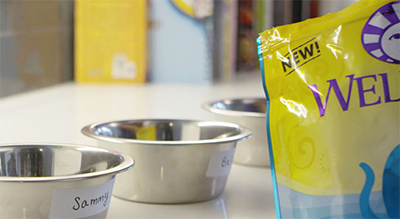 Feed a high-quality, natural food that’s appropriate for your cat’s life stage and health. It’s also important to feed the right amount of food based on stage of life, health and physical activity level. 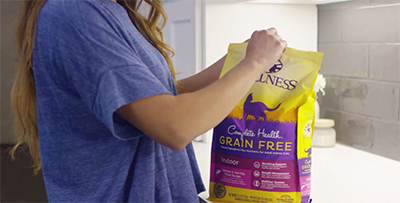 Wellness recently introduced new Complete Health Grain Free dry recipes for cats which may be a good option. 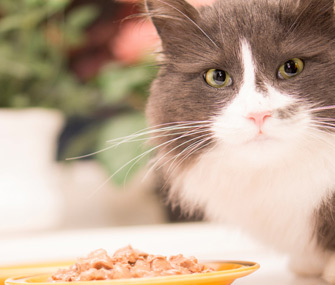 If you’re unsure of how much food your cat should be eating, talk to your veterinarian. Create a feeding area that takes your cat’s natural instincts and preferences into consideration. Avoid the mistake of placing the feeding station close to the litter box. It may seem tempting to create a convenient “cat area” but a cat’s natural survival instinct is to eliminate away from the nest in order to avoid attracting predators. If you place the food bowl close to the litter box it may cause stress when it’s time to eat or it may even result in a litter box avoidance problem. If the feeding station and the litter box must be in the same room, make sure they are on opposites sides with maximum distance between them. The most common location for the feeding station is in the kitchen. This works well for most cats but if the kitchen area is chaotic or noisy, your cat may prefer a more quiet, private area. Choose a feeding station location that allows your cat to eat undisturbed. A bowl is a bowl you say? Not true. Let’s start with the cat’s whiskers. Those long whiskers on your cat’s face are very sensitive and most cats find it uncomfortable for them to be squished or bent. If the food bowl is too deep or narrow, your cat will either have to withstand having the whiskers bent, or she may start dipping her paw in the bowl to scoop the food out. This is common in cats who experience whisker stress or discomfort. The food bowl should be shallow so your cat can easily get to her meal without any discomfort. This applies to the water bowl as well. While you want to make sure your cat always has an adequate supply of fresh water, if the bowl is too narrow, she may experience the same whisker stress. Many cats prefer their water to be separated from the food. In fact, it’s a good idea to have several water bowls scattered throughout the house to make it convenient for your cat and to encourage more water intake. When your cat is thirsty and looking for water between meals, she doesn’t necessarily want the scent of food nearby. It comes down to a cat’s natural survival instinct and even if your cat never sets one paw outdoors, she still retains those instincts. Avoid using double feeding bowls that keep the water and food connected. Food can easily fall into the water, causing contamination and it also changes the taste of the water. In the wild, a cat would typically eat several small meals per day. Cats have small stomachs and aren’t like the lions on the Savannah who gorge on food and then don’t eat for a while. Cats hunt small prey because they’re small animals. If unsure about the quantity to feed, talk to your veterinarian about how much your cat should eat in a day and then divide up that portion into several smalls meals. If you’re gone for long periods during the day, consider a timer-controlled feeder that will keep wet food fresh and open for feeding at the precise time you set. There are also timer-controlled feeders for use with dry food. If you do feed dry food, there are many food-dispensing toys you can use to give your cat the added bonus of having playtime during meals. Working for food is a natural concept for a cat so batting a puzzle feeder around to get a food reward can add more fun to mealtime. Feed wet food at room or body temperature. Cold food straight from the refrigerator may cause stomach upset and also isn’t as appealing. In order for the enticing aromas to do their magic, food should be at least at room temperature. Cats aren’t scavengers and in the wild, they determine whether a food is safe by the temperature and smell. A cat uses her nose to detect temperature and freshness. Variety is good in a cat’s diet but changes must be done gradually to avoid causing tummy upsets or food rejection. Cats are creatures of habit and an abrupt change of food may cause her to turn her little nose up at what might be a high quality, highly nutritious meal, just because it’s unfamiliar. When changing to a new flavor or formula, add a little of the new food into the current brand and increase the amount over the course of a few days. If you’re transitioning to a new food and your cat doesn’t eat, it might be that you’ve added too much of the new food too soon. Back off on the amount for a few more days until your cat has adjusted to the change. Your cat is an individual so go at the pace that works best for her. She’ll let you know when you’re doing it correctly. Although cats are social animals, they are not social eaters. If you have a multicat household, you can greatly decrease stress and increase a sense of security by making sure each cat has their own individual bowl of food. Cats don’t necessarily feel comfortable eating side-by-side as well, so separate the bowls to provide more comfort and peace. If any of your cats engage in resource guarding or there’s tension between them, set up feeding stations in different rooms so everyone feels safe and you eliminate any feelings of being threatened. If feeding wet food, take up the dish after about 20-30 minutes so it isn’t left to dry and harden. It’s very unappealing for a cat to walk by the feeding station and get a whiff of old, rock-hard wet food. Take the bowl and wash it, wipe up any spills and keep the feeding station area clean so it’ll be most appealing for the next meal. Wash water bowls daily and refill with fresh, clean water as well. Use playtime before meals to help encourage a healthy appetite. 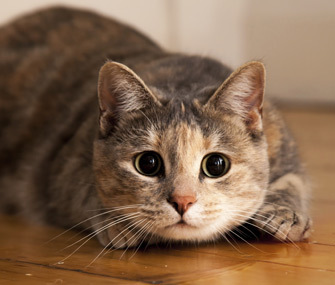 As a hunter, if a cat had to depend on her own skills to obtain a meal, she’d have to go through some physical activity as she stalks, chases and pounces to capture dinner. The concept of working for food is natural for cats, and luckily, you can incorporate that in a fun way by using playtime. Engage in an interactive play session with your cat before meals. Use a toy based on a fishing pole-type design so you can maneuver it like prey to encourage your cat to show off her skills. 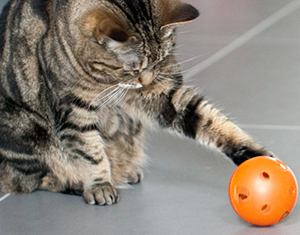 Customize the play session to fit your cat’s age, health and physical ability. Even a quick little game may ignite a spark of energy for a cat who may have been sleeping much of the day. Then, after a job well done, the might hunter gets her reward in the form of a healthy, delicious meal.